Joey the Wondercar, Leah's valiant little Cinquecento, (Fiat 500) took us on a delicious road-trip yesterday. We wandered, really meandered, from Genova to Portofino and back again, with many stops along the way ... lunch, coffee, aperitivo. That would be Leah, the Canadian blogger writing over at, Help I Live With My Italian Mother In Law. The one who laughingly told me, that my camera gear was the only thing that saved me from a soaking yesterday. The Ligurian coastline is completely underrated, almost a secret, but I kind of like the peace of that. And as you can see, if you know New Zealand ... it reminds me of home. Everything was beautiful out there. Divine even, without exaggeration. There was this confused feral cat, who stretched and smooched nearby but hissed if we reached out to stroke her. She was a beautiful creature. And we met up with Leah's little dog soul-mate, and I whispered to him as I clicked the shutter. Well, we found these hammocks, up in the olive grove, above Leah's house. I have wanted a hammock my whole entire life. I had spent a few hours in one as a child and loved it. 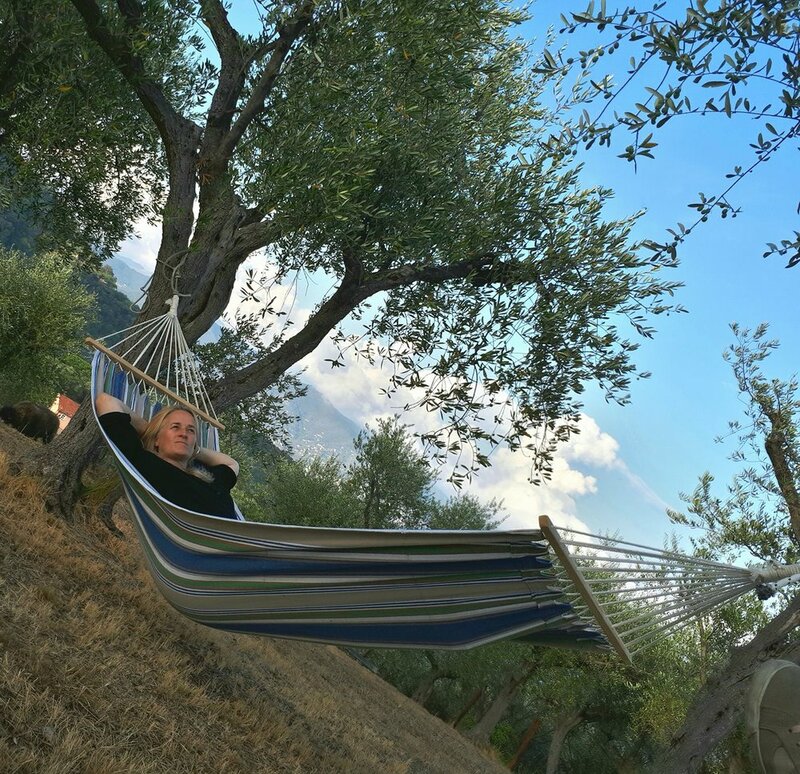 I thought I had died and gone heaven yesterday, up there on the top of the hill at Portofino, in the hammock hanging between two olive trees, as the sun started its slide into sunset. And on the way home, walking back through the city, people called out and greeted me. And that's gold when you live in a country not your own. Giovanni Tiso Writes ... and David Whyte too. Giovanni Tiso wrote a beautiful piece about childhood homes and memories ... To visit now, if only electronically, to see that light again and the shallow sky, is to relieve the migrant’s grief for places and a life left behind. I know these feelings he writes of, so well ...I cannot say that I miss this place, in the sense that there is no place for me there. Not in my grandparents’ house, that was sold over twenty years ago; not in the village, where I couldn’t build a life if I wanted to. I have a fondness for it that is reserved to distant things and for the past. I miss the people in it, but especially those who are no longer there. I miss my childhood, or maybe more precisely the idea of it: those interminable summer days and weeks, all identical to one another yet always charged with the remote possibility of adventure. I do not subscribe to the current fashion for romanticising boredom, but I wouldn’t trade that sameness, my few friends, our games for excitement and travel.